The UEFA Nations League is getting more interesting with regards to results, as England became the latest to make their mark. The Three Lions went into Monday’s clash against La Roja, having won just one of their last five games in all competitions. However, this was a totally different proposition as Gareth Southgate’s charges emerged 3-2 winners over Spain in Seville. Manchester City forward Raheem Sterling put England in front after just 16 minutes, following a neat combination with Marcus Rashford. The Three Lions doubled their lead 14 minutes later, this time Rashford getting on the score sheet after being set up by Jamie Vardy. In what was a totally one-sided first-half, Sterling scored his second on the night as England went into the break 3-0 up. Spain began to play better in the second half but found it difficult to break the England defence. It took until the 58th minute for substitute Paco Alcacer to reduce the deficit to 3-1, having been on the pitch for just two minutes. Sergio Ramos then made it 3-2 in the dying embers of the game to prevent the encounter from ending in embarrassing fashion for the hosts. 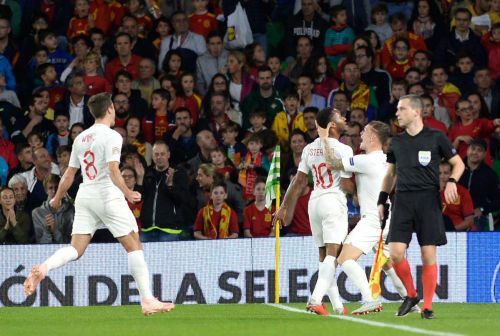 The result represents England’s first win in the UEFA Nations League, following a draw to Croatia and a 2-1 loss to Spain in the reverse fixture. For Spain, though, this was the country’s first loss in four games (three of the Nations League), having won each of their last three games on the spin (including the friendly versus Wales). It also represents the first loss that coach Luis Enrique has suffered since taking charge of La Roja after the 2018 World Cup in Russia. As tight as the result was, it has sparked social media into a frenzy, with many football fans taking to Twitter to express their views. For some, the result came as a huge surprise, considering the fact that Spain had beaten England at Wembley just over a month ago. However, football has a way of making nonsense of logic, and this was definitely one of those scenarios. Yes England might be giving Spain an absolute pasting in their own backyard, but don't let that disguise the fact the Welsh think we had an easy run in the World Cup..
Spain cannot handle Harry Kane tonight. He pulling them all over the place. Two assists so far, terrific movement and hold up play. Involved in the first goal as well. Lovely ball from Barkley to find him for the third as well.